Solar power is attracting great attention from the Vietnamese Government and businesses, but certain challenges are facing the utilisation of this type of renewable energy. In April 2017, Prime Minister Nguyen Xuan Phuc issued a decision on mechanisms for encouraging solar power development. This decision has given a boost to this sector as it set up an attractive price for solar electricity – 2,086 VND or 9.35 US cent per kWh – for 20 years, compared to the current average power price of 1,500-1,700 VND per kWh. It also includes other incentives in terms of tax and land. As a result, while the number of registered solar power projects was still modest by early 2017, 121 projects with a combined capacity of over 9,200MW had been added to the electricity development plan as of September 2018. Meanwhile, another 211 projects with a total of 16,800MW haven’t even been named in the list yet. Dr. Nguyen Huy Hoach from the Vietnam Clean Energy Association said the national electricity development plan for 2011-2020 requests that power projects using renewable energy resources, including solar energy, be accelerated so that their capacity will reach 850MW by 2020 and 4,000MW by 2025. To that end, solar power generation facilities with a capacity of over 200MW, 600MW, and 1,600MW will need to be installed each year by 2020, between 2020 and 2015, and in the five following years, respectively, he added. 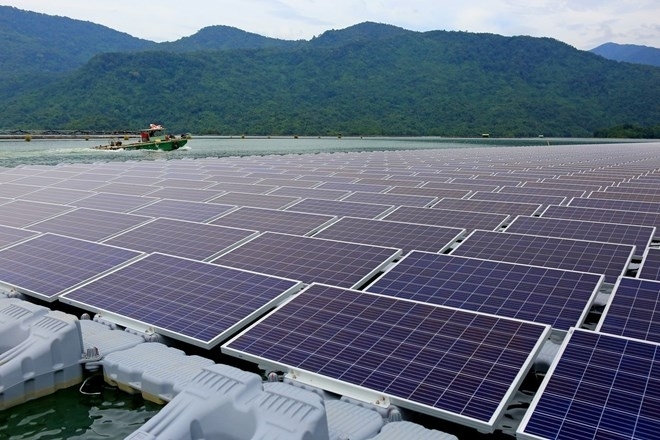 Diep Bao Canh, Chairman of the Red Sun Energy JSC, said Vietnam now has a chance to strongly develop solar power as more and more businesses enter the industry. Additionally, equipment prices have declined considerably as solar panel prices have dropped from 3-4 USD per Watt peak to less than 0.5 USD per Watt peak. The country’s natural conditions, including the average solar irradiance of 4.5-5.5 kWh per sq.m each day, are also favourable for solar power development. However, it is not a completely smooth path for solar power development in the country. 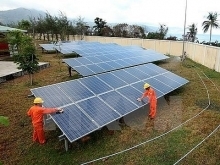 According to the Vietnam Energy Association, certain technical solutions are needed to convert electric current to connect solar or wind electricity plants with the national grid. As the grid’s connection points with wind and solar power factories increase, risks of operational problems also arise. 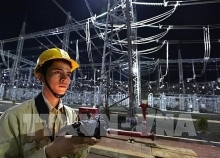 Dinh Quang Tri, Deputy General Director of the Vietnam Electricity (EVN) group, said the connection will raise transmission and distribution expenses, elaborating that most of these plants have been planned in the central region, especially Ninh Thuan and Binh Thuan provinces. Meanwhile, the local transmission system is quite weak as the electricity demand here is lower than other regions. The EVN has asked for more transmission lines to be constructed, but the work is related to procedures and site clearance, so it will not be able to be completed soon to transmit all electricity from solar power plants. Tri added that if the EVN does not purchase solar power, an electricity shortage is likely to happen. However, if the group, designated to buy all electricity from solar power projects, fails to load, disagreements between project investors and the EVN could occur. 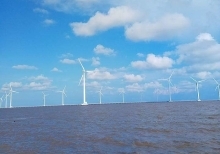 Le Van Luc, Deputy Director of the Electricity and Renewable Energy Authority at the Ministry of Industry and Trade, said that with favourable policies, Vietnam is attracting investment in solar and wind power. However, there haven’t been detailed analyses of where such projects should be located in or how to connect them with the national grid. Even in potential areas like Binh Thuan and Ninh Thuan, more studies on the projects’ connection and operation are needed to ensure safe, constant and stable supply. Luc also pointed out problems in dealing with waste from solar power plants, such as panels, since there hasn’t been a detailed guidance issued on how to treat it.